This curriculum pack is intended to be a resource for teachers to use within Personal & Social Education (PSE). 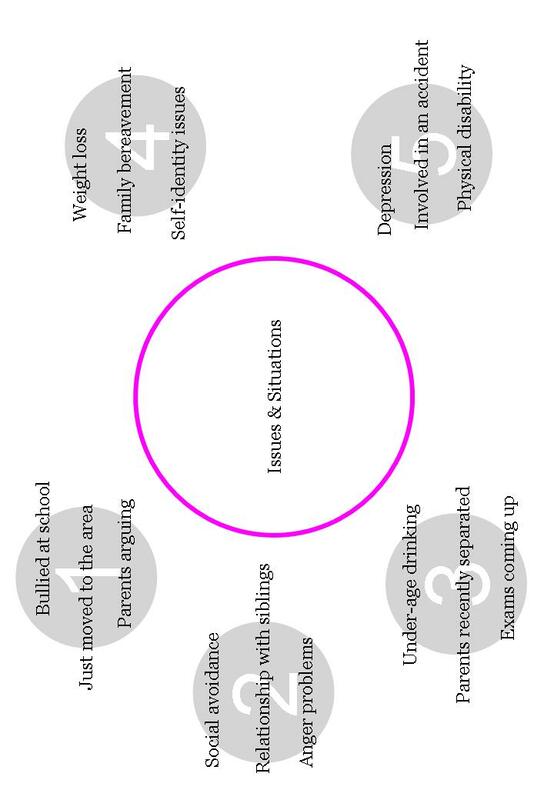 Embedded within it are the Health and Wellbeing Experiences and Outcomes that can be found within Curriculum for Excellence (2009). It is structured and designed in a way that will stimulate thought and discussion amongst pupils; engaging them with interesting and emotionally relevant content. Activities presented in this workbook are intended to challenge pupils to better understand and appreciate the role that feelings and emotions have, both for themselves and for those around them. It is intended to prepare pupils for the future, offering them the opportunity to learn more about emotions; mild to moderate mental health problems and strategies to prevent, cope with, or overcome such issues. They will also be better equipped to engage with and support others who experience such difficulties. The activities broadly focus on the promotion of emotional health and wellbeing, and the prevention of mental health problems and emotional difficulties. They also cover the core experiences and outcomes within the Mental, Emotional, Social and Physical Wellbeing organiser at the Third and Fourth level of a Curriculum for Excellence, which are the responsibilities of all (see Appendix 1: Mental & Emotional Wellbeing). Themes such as inclusion, equality, diversity and stigma may also be introduced and developed using these materials. 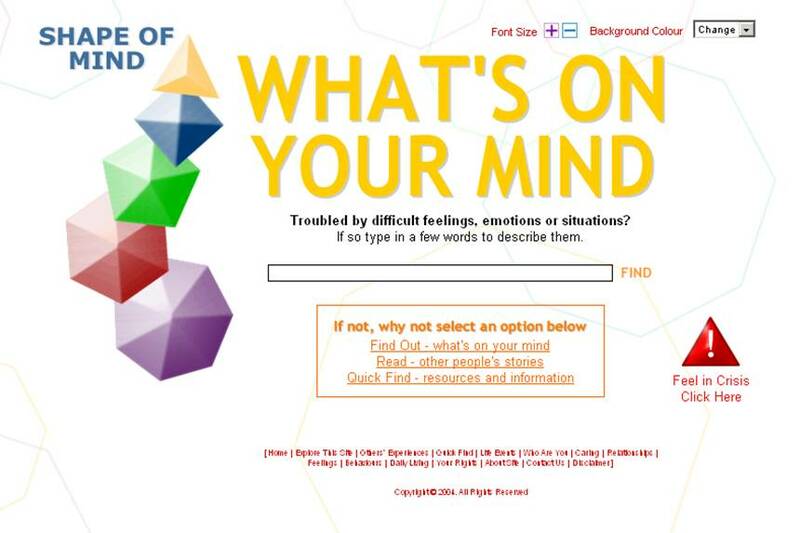 Shape of Mind is a website designed to offer information and advice to those experiencing difficult situations, thoughts, feelings, emotions or behaviours (see Appendix 8: How to access / navigate the site). It contains various interactive sections to promote problem solving, relaxation and coping skills, as well as a number of self-help guides for difficulties such as depression, anxiety, stress and panic. The site also utilises a database of local and national organisations and services. This curriculum package was designed and developed following a request to provide support materials to teachers delivering mental and emotional wellbeing elements of the PSE curriculum. It was written in collaboration with education staff from Clackmannanshire, Stirling and Falkirk Councils. Support and feedback has also been provided by Educational Psychology and Child & Adolescent Mental Health (CAMHS) services. The Shape of Mind resource supports learning in many aspects of health and wellbeing (see Appendix 1: Mental & Emotional Wellbeing). It ensures that young people develop the knowledge and understanding, skills, capabilities and attributes that they need for mental, emotional, social and physical wellbeing now and in the future. Staff may also find the contents of this pack useful in maintaining their own mental & emotional wellbeing as they become familiar with its contents and associated materials. The aspiration for all children and for every young person is that they should be successful learners, confident individuals, responsible citizens and effective contributors to society and at work (see Appendix 2: Four Capacities). By providing structure, support and direction to young people's learning through curriculum design, this programme should enable them to develop these four capacities. A person's understanding of emotions and ability to cope with them develops over time and with experience. 'Emotional Literacy' may be described as the ability to recognise, interpret, communicate and cope with personal emotions and the emotions of others. This can be difficult and challenging at times, and having skills to effectively and appropriately manage emotions can be really helpful. This curriculum package aims to support and encourage the development of emotional literacy by presenting a range of emotional issues in a structured manner. Some of these topics may be relevant to the young person or those around them at the time, or in the future. A safe and supportive environment should be maintained when exploring such topics, in which curiosity and empathy may be encouraged (see p12 - Issues to consider). Through exposure to example stories, presented as a third person narrative, pupils will be invited to consider and explore issues, emotions and strategies. It is hoped that through this process, pupils will be more aware and informed about the impact that emotional and mental health issues can have. They may also develop resilience as they become better equipped with an understanding of strategies that can help them to address and overcome challenges that they face in the future. Each activity or exercise is structured in a similar way, with content representing a story about a fictitious individual's situation. 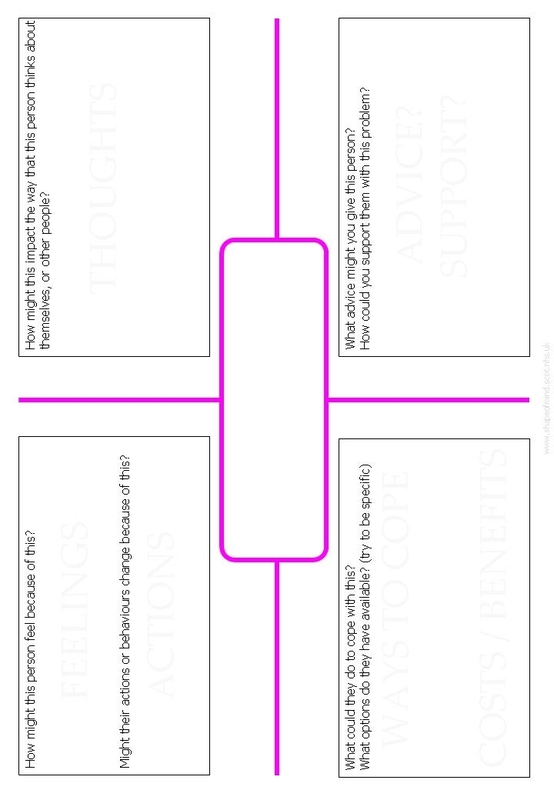 These vignettes or case-studies are presented in the third person so that pupils can work together to discuss, support and advise the individual. Pupils may be asked to filter, evaluate, collate and perhaps present information to others in order to gain a greater understanding of a situation and its impact, on behalf of the person described. Working through this curriculum package, pupils will begin to develop knowledge, understanding and skills around the subject of mental and emotional wellbeing. They will also have experience of using a number of more generic skills, many of which link to other curricular areas. (See Appendix 3: Core Skills). A difficulty or problem that the person described is experiencing. Some positive activity or support already in place for the person that might help them cope with difficult situations or issues. An approach, skill or action that might help the person to actively engage with, cope or overcome the issue or situation. Elements of this package may be delivered using a variety of different approaches. A range of methods and formats may be appropriate depending on the issue, pupils and teacher preference. Materials might be used for a single one-off session, or across a series of lessons. One format may be used throughout, or a mixture of approaches. Pupils could be encouraged to collate exercises into a portfolio workbook of issues and strategies covered during the course. Concepts may be explored using a problem-based learning approach. Pupils may be provided with a scenario and challenged to plan strategies and approaches to address the issue. Pupils may be provided with copies of an exercise sheet in order for them to independently explore different topics. Whole class or small group discussions may be facilitated around particular topics. This might be done by distributing materials or digitally projecting the contents of an exercise for the whole class to see. Sessions may be split to allow time for discussion within groups and then, where appropriate, feedback to the whole class. These resources may be used as a springboard into further discussion, debate and possible role-play exercises (see p16). Pupils can make use of the 'Shape of Mind' website as individuals, in small groups, or as a class where facilities exist (see Appendix 8: How to access / navigate the site). This companion resource will support pupils to more fully investigate and explore issues, identify advice, options and strategies. If internet access is not possible then exercises may also be completed 'off-line'. Each scenario component is represented as a stand-alone item which may be introduced in isolation. By presenting the topic in isolation, with no surrounding context, this approach can facilitate pupils' focused consideration of a specific issue. Alternatively, a series of components could be presented from each type-set (ie an issue, protective factor and a strategy). In this way, pupils may be encouraged to consider how different components could interact and potentially modify the impact of an issue. This approach, by offering a background context, introduces a higher degree of complexity. When presenting a series of components, these could all be issued all together, simultaneously. However, components may be introduced in stages over time as additional information to form a narrative storyline that may flow through the lesson. This could reflect a 'real-life' timeline and interaction of issues, which might challenge pupils to modify their understanding and approach. As pupils receive more information about the scenario, they should be encouraged to actively reconsider the information that they have available. This may introduce alternative perspectives as they adjust their understanding and interpretation of the situation. Having made use of resources in order to assist the individual described in the exercises, pupils may be more likely to return to the resource themselves whenever they experience difficulties. They may be more prepared to engage with a tool or service that they have become familiar with through this work. For example, having found details of a helpline, self-help guide, or used a searchable online resource such as 'Shape of Mind'. Other resources may be useful in supporting the delivery of this curriculum package, and a list of some of these has been provided (see p18: Additional Resources). Resources have been designed such that the content may be presented in a manner appropriate to the group of young people being addressed. Issues may be introduced progressively, as required, or as illustrated in our prepared examples. Elements may also be presented in isolation, or, for higher ability groups, in combination to reflect a more complex context and scenario. Progression or differentiation may be achieved by balancing the complexity of individual topics, along with any interactions presented. In order to address appropriate topics, a structured progression is suggested below. Teachers should consider what is appropriate for a class to cover. Five phases have been illustrated, but these are flexible and may be shuffled depending on requirements. Suitable topics should accumulate, so issues can be used or re-used at later stages, perhaps in the context of more complex scenarios. Teachers familiar with the materials, and working with more advanced topics, may eventually choose to break-out into using any combination of multiple issues to construct 'pick and mix' scenario in order to explore and discuss a more complex narrative, and the interaction of different elements. 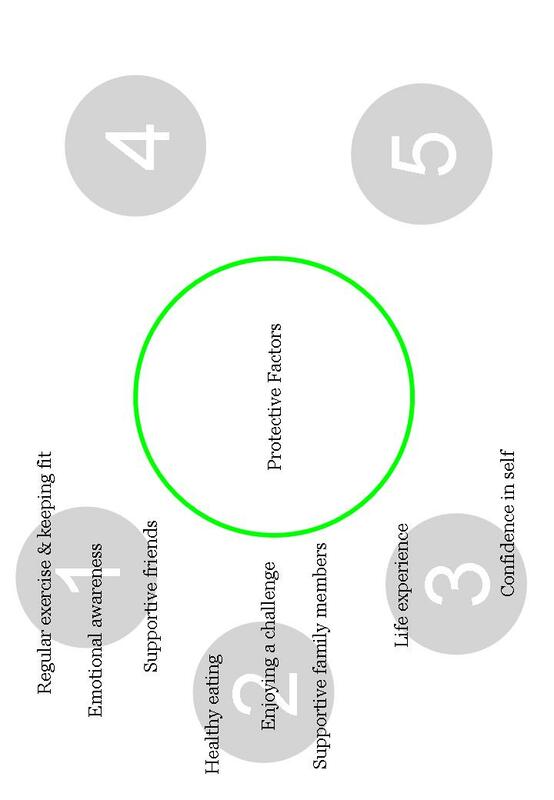 Protective factors and strategies may be presented in a more flexible manner. 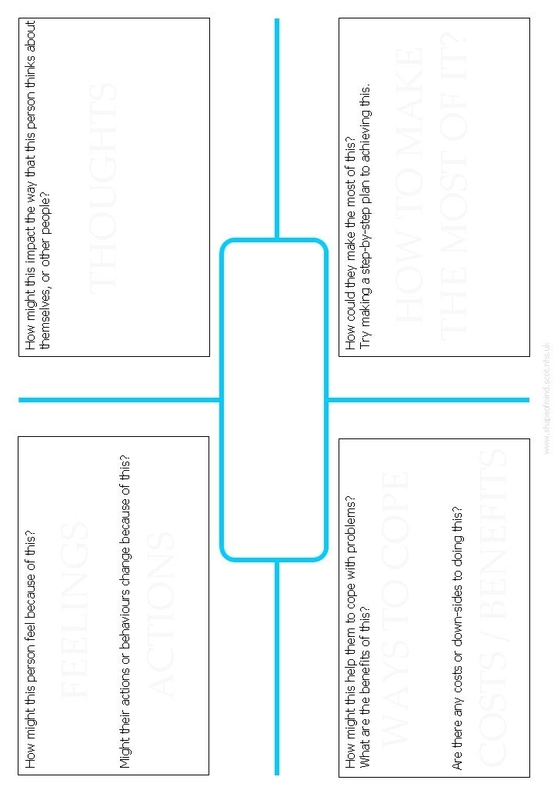 A suggested structure for introducing topics is illustrated on the following page to assist teachers in planning sessions. Blank exercises may be amended by pupils or teachers to generate their own scenarios to extend the use of the package (Appendices 12-14). This facilitates the addition of specific topics, perhaps simpler issues, or more complex subjects as relevant and appropriate to the class. A selection of topics and combinations, along with the stages at which it might be appropriate to introduce them (see Appendices 9-11). 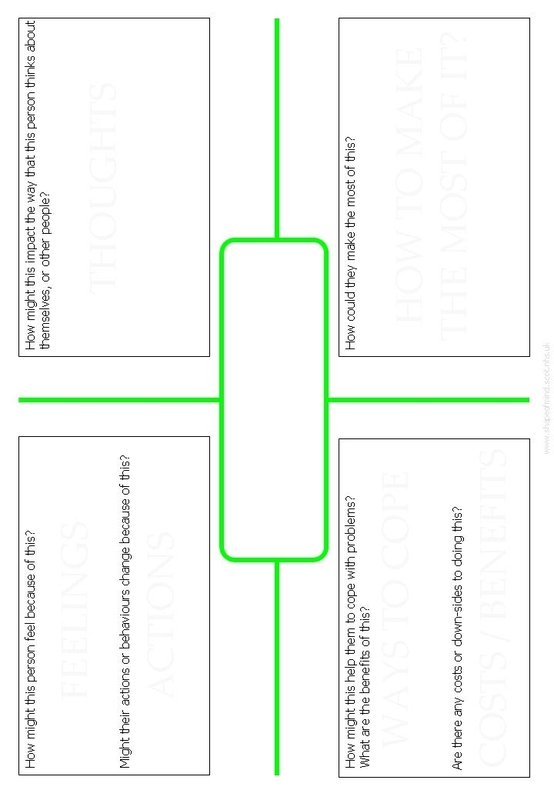 Some example lessons are highlighted as coloured boxes. Due to the emotionally sensitive nature of the topics covered in this curriculum package, it is necessary to clearly establish a safe environment for pupils and teachers to discuss such matters. Doing so may include stating certain rules and informing pupils about resources that can be made available. Revision of these issues may be required at the beginning of every lesson. Be mindful of your own situation, experiences and sensitivities. Consider whether you feel comfortable and able to lead and manage a discussion around an issue which is very relevant to your own circumstances. Especially around listening to others and respecting the opinions of others during discussions. Especially with regard their disclosure of examples. Also a clarification of the limits of confidentiality around child protection. Pupils (and teaching staff) should not be required or encouraged to disclose information about their own experience. Teachers should be prepared to offer time after such a class in order to answer questions and signpost pupils to appropriate further help. Making available a safe place for pupils to access in order to discuss issues raised. The relationships between pupils and teacher should be established. It is best if pupils are familiar with staff members, and you are familiar with the pupils in order to be supportive and sensitive about the topics covered. Confidentiality, privacy and sharing of information. Try to structure the session with sufficient time that topics are not left incomplete. Pupils should not leave a session with unresolved questions. Signposting to services, organisations and information as required and if appropriate. Knowledge of resources and services to be accessed for pupils if they want further support. Awareness of services that may be able to assist, advise or support the delivery of this material. Access to training and professional development opportunities in order to better prepare yourself to introduce these subjects and facilitate pupils understanding and discussion. The core experiences and outcomes within this programme describe the expectations for learning within the Mental, Emotional, Social and Physical Wellbeing Organiser within Health and Wellbeing (see Appendix 1: Mental & Emotional Wellbeing). Learning across the curriculum allows practitioners to make links between subjects, drawing on a range of themes and topics. As with all aspects of Curriculum for Excellence, assessment practices should be seen from the perspective of the learner. Learners should be engaged in all aspects of assessment processes and be afforded an element of choice and personalisation in showing that they have achieved the intended outcomes. The following core Quality Indicators may help staff evaluating and improving learning and teaching based on the 'Shape of Mind' package. The aspects addressed within each of the key areas are closely inter-related, linking with other Quality Indicators. They are designed to help identify strengths and priorities for improvement. This programme can be linked to other curricular experiences and outcomes. Interdisciplinary studies, based upon groupings of experiences and outcomes from within and across curriculum areas, can provide relevant, challenging and enjoyable learning experiences and stimulating contexts to meet the varied needs of young people. Having initially introduced a topic, you may want to explore the subject in more detail. These may lead off into other subject areas. Communication & Relationships - What are appropriate and inappropriate things to say and do? Problem solving - How do you make a important decision? Do you weigh up costs and benefits? Stigma & Stereotypes - What do you think about a person who has mental health problems, a physical disability, etc? Lifestyle issues - What does a healthy lifestyle look like? Is this a goal for you? Why not? Exam preparations - How do you deal with stress? What are the consequences of failure? Self-identity - How do you define yourself? How do you feel about yourself, your self-esteem, confidence levels, etc? How do others see you? Resilience - What could you be doing now to help you cope in the future? Students may be given an exercise to write a sketch, diary entry or short story about a character experiencing a difficult scenario, for example on the topic of bullying. Pupils could be encouraged to dramatise, act-out or mime the content of their scenario, making use of their acting and public speaking skills. Particular emphasis could be placed on the delivery of an appropriate emotional reaction. As it may be relevant to a current news item, a subject such as stigma, equality and diversity may be introduced during a session looking at an individual who is affected by disability, for example. Holding a debate, with representation from both sides, about whether the legal age for alcohol consumption should be changed. Asking pupils to design a poster or slogan to promote an appropriate coping strategy, such as healthy eating or relaxation. Thanks to all those who have been involved in the consultation, design, testing and promotion of this resource. Mental, emotional, social and physical wellbeing are essential for successful learning. The mental, emotional, social and physical wellbeing of everyone within a learning community should be positively developed by fostering a safe, caring, supportive, purposeful environment that enables the development of relationships based on mutual respect. The four aspects of wellbeing are inextricably linked and are only separated here for practical purposes. I understand the importance of mental wellbeing and that this can be fostered and strengthened through personal coping skills and positive relationships. I know that it is not always possible to enjoy good mental health and that if this happens there is support available. The detailed wording of the four capacities forms a very useful focus for planning choices and next steps in learning. The attributes and capabilities can be used to assess whether the curriculum for any individual child or young person sufficiently reflects the purposes of the curriculum. Working through this curriculum package, pupils will develop knowledge, understanding and skills around the subject of mental and emotional wellbeing. They will also have experience of using a number of more generic skills, many of which link to other curricular areas. Young people should find their learning challenging, engaging and motivating. The curriculum should encourage high aspirations and ambitions for all. At all stages, learners of all aptitudes and abilities should experience an appropriate level of challenge, to enable each individual to achieve his or her potential. They should be active in their learning and have opportunities to develop and demonstrate their creativity. There should be support to enable young people to sustain their effort. All young people should have opportunities for a broad, suitably-weighted range of experiences. The curriculum should be organised so that they will learn and develop through a variety of contexts within both the classroom and other aspects of school life. Young people should experience continuous progression in their learning from 3 to 18 within a single curriculum framework. Each stage should build upon earlier knowledge and achievements. Young people should be able to progress at a rate which meets their needs and aptitudes, and keep options open so that routes are not closed off too early. There should be opportunities for young people to develop their full capacity for different types of thinking and learning. As they progress, they should develop and apply increasing intellectual rigour, drawing different strands of learning together and exploring and achieving more advanced levels of understanding. The curriculum should respond to individual needs and support particular aptitudes and talents. It should give each young person increasing opportunities for exercising responsible personal choice as they move through their school career. Once they have achieved suitable levels of attainment across a wide range of areas of learning the choice should become as open as possible. There should be safeguards to ensure that choices are soundly based and lead to successful outcomes. Taken as a whole, children's learning activities should combine to form a coherent experience. There should be clear links between the different aspects of young people's learning, including opportunities for extended activities which draw different strands of learning together. Young people should understand the purposes of their activities. They should see the value of what they are learning and its relevance to their lives, present and future. "David has recently moved to the area." To give pupils the opportunity to discuss and explore feelings, and the emotional impact of the outlined scenario. In this case 'moved house'. This will allow pupils to practice empathy and begin to feel more confident to support others or cope with difficulties themselves. Thoughts - I won't make any friends. This place will never be as good as where we lived before. Introduce further element to scenario - eg Strategy = "Joining a club or group"
This evaluation may be completed at the end of a series of topics. What issues did you find the most interesting to think about? Are there any topics that would be helpful to cover if you did this work again? Do you have a greater awareness and understanding of emotional issues? Do you feel better equipped to talk about and manage emotions? Do you know how / where to access support if you needed to? Is there anything that you feel the site doesn't cover that it should? Would you go back to the site in your own time? Shape of Mind is a website which contains resources and materials to educate and support young people with emotional issues. The website may be used as a tool to support pupils answering the questions posed in this workbook. Due to the nature of the questions, they will also have to draw upon their own social and emotional experience as well as exercising skills such as empathy. Using the Shape of Mind website, pupils may execute keyword searches and explore the site in order to inform their approach to an issue. Use search-engine to find "Shape of Mind"
The Shape of Mind site may be navigated primarily using text searches. Having accessed a page on a certain topic, you can then click on links to resources and information which are available on that subject.